For the last 3 years my son, Christian Wright, has played exclusively for Victory teams, including Select and Box. This winter season he will be joining our local team (OC Rebels) so that he can play alongside and build relationships with the kids that he’ll likely play in high school with next year. As excited as he is for this opportunity to continue to grow and develop his lacrosse skills with a new team, he will really miss his Victory family. As he moves on to another team and program I wanted to send a sincere thank you for the positive impact and influence you’ve had in Christian’s young athletic career. He may be wearing a different uniform this next season, but I am confident that he will continue to represent “The Victory Way”, carrying the principles the program practices, promotes, and teaches, with him on (and off) the field—a Victory ambassador. Thank you, ALL, for shaping my son’s life and the lives of so many players in the tough competitive environment of youth sports today. DIG for Life! “Thank you sooooo much John, Sushi, Gunner and Hunter for all of the time, love, energy, dedication and faithfulness you poured into these awesome boys!!!! What an incredible season and it wouldn’t have been possible without your devotion to the boys and to the game of lacrosse!!! You are all amazing!!!! – Angie & Kevin T.
My wife and I fully support the approach you are taking, the values you are teaching our boys and the importance you are placing on keeping our young men playing, learning and growing and not necessarily on winning at all costs. It’s unfortunate the some of us parents get caught up in living vicariously through our kids and forget about what is really important…teaching our kids how to be strong, positive and continue to strive to do their best despite challenges that may be above their current abilities and skills. Our boy is not yet one of the gifted players on the field given his newness to the game and some other challenges he will need to overcome before being able to compete at a higher level however; the approach you are taking in fielding U13 teams which affords the kids to see a lot of playing time and providing them with opportunities to develop for a day when the games matter a bit more is certainly the preferred approach to assembling a team of 25 kids which results in limited playing time like the team the boys played this past weekend. I believe your approach will produce kids who possess more advanced skills when they reach high school and beyond. I also want to thank you for responding so quickly whenever you hear/sense things like this may be creeping into your organization. No one enjoys being on the losing end of lopsided games; it’s much more fun when playing golf with buddy’s, attending a party etc. To tell our friends about how our boys win games…we just have to remind ourselves it’s about our boys and their long term growth and not about instant gratification for us parents. “Thank you Coach Glen and your staff for a great experience! 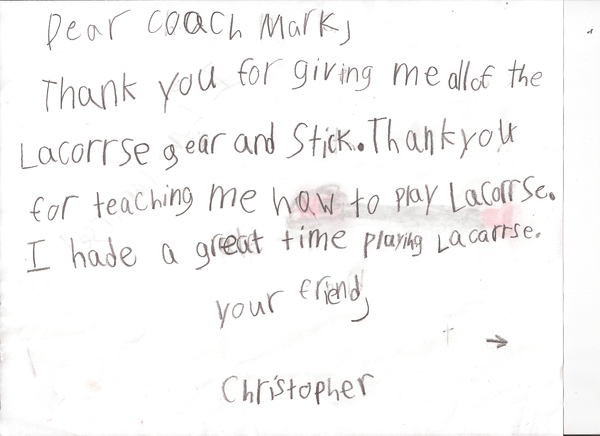 My son Christopher very much enjoyed his Victory summer lacrosse camp. He was tired after each day because he worked hard, but at the end he was smiling and even made a few new friends at camp. “I want to say firstly that my son loved it yesterday! He wasn’t sure what to wear, so he wore his Naval Academy shorts which are not the normal long shorts. I think he was a bit overwhelmed by all the kids and being its mainly all south county kids he really didn’t know anyone, and he noticed quite a few kids from the same programs. He was one of the smaller guys and kind of lingering near the back of the group most of the time. I was really curious to see what he thought afterwards. He loved it, he said he was a bit nervous. He loved all the coaches, and the young man who just graduated from the Academy helped Jake set his helmet and stick during warm ups and mentioned he was number 17, which is the number of his VLAX pennie. 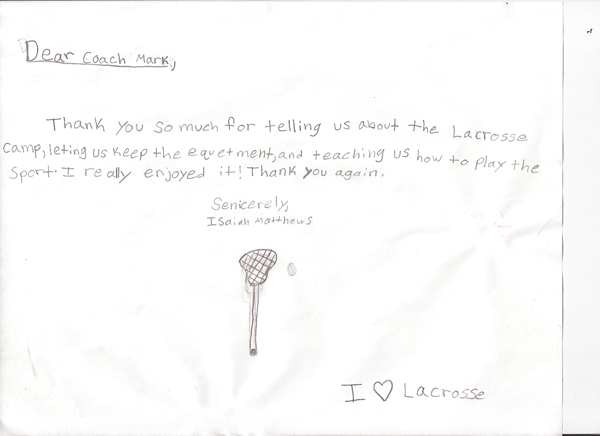 He wanted to tell him so badly he went to the Navy lacrosse camp, and wanted to meet you as well. He has Sectional Finals in San Marcos next week for soccer, and if they don’t finish top two in their group he is determined to get back for lacrosse on Sunday.